Despite what we have always been told, it is possible to eat – and enjoy! – oysters all year round. You’re not limited to just the months that end with R.
This rule, evidently developed prerefrigeration, was made for three primary reasons. The first to help remind people that during warmer months it is much more likely that shellfish will spoil in the heat. As we all know, however, thanks to the miracle of modern refrigeration, these days, it is much easier to keep oysters fresh and safe for consumption. The second is that increased ocean temperatures during the non-R months can make for more harmful bacteria in the water, which in turn, is then filtered by the oysters. When ingested, these bacteria can make humans sick. Responsible fishmongers and oyster-enthusiasts alike understand the importance of harvesting these briny delicacies responsibly from cool-water farms, especially during months that are potentially problematic. Still, it is important to note that the only way to ensure you won’t get sick from eating raw oysters is to cook them. The third reason given for not eating oysters in the late spring and summer is that oysters spawn in warmer water. This can give them a fattier, sweeter and milkier texture, unlike the more firm, briny ones found more readily in the winter. But they can still be enjoyed just the same. I discovered this for myself on a recent trip to Brittany, and was surprised by how sweet and pleasant they were. In France, oysters are enjoyed simply – either plain or with a squeeze of lemon juice to turn up their natural sea flavours. 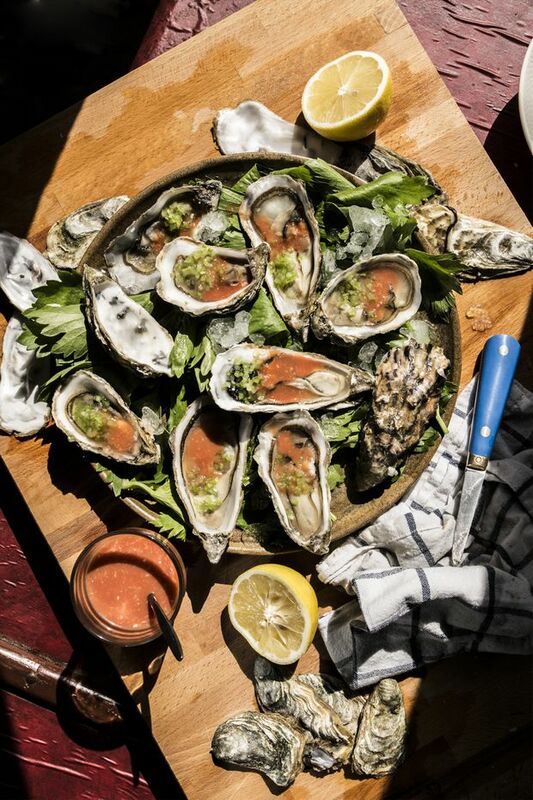 For sweeter spring and summer oysters, I prefer to eat them with an added dose of mignonette, a classic sauce served with raw oysters made with vinegar, minced shallots and freshly cracked black pepper. This recipe kicks mignonette up a notch by playing on Canada’s classic cocktail, the Caesar. The acidity of the tomatoes and the spiciness of the tabasco in this recipe lend well to the sweetness of the small Fine de Claire oysters I picked up from the fishmonger. Fine de Claire oysters are common here in France, but feel free to substitute any other smallish oysters you can find near you in Canada, such as Kusshi or Fanny Bay for example. The brunoise of celery is annoying to cut, but you will see is far superior to chunks or slices. If not for the extra Caesar-style garnish flavour it lends to the mix, then for the fact that it makes slurping back a dozen or so of these babies all the more convenient. One final note: You will need an oyster shucker and clean tea towel to crack open these delicacies during preparation. Add all ingredients into a small bowl and whisk until combined. Store in the fridge until ready to serve. Can be made in advance. Start by wrapping the tea towel around the flat end of one of the oysters. The hinge end should be facing you and should not be covered by the towel. Holding your left hand on the towel wrapped end of the oyster in order to secure it, insert the oyster knife into the small gap between the two shells. Gently but firmly, begin to twist the knife into the hinge. It is important not to push too aggressively or try to force the oyster knife through the hinge as this might increase the chances of the knife slipping out and cutting you. Take your time and be careful. Once the knife has twisted and wriggled in between the two shells far enough, you should be able to feel it. Rotate the knife away from you until you hear a “pop” as the top and bottom shells are released from one another. Unwrap the oyster from the towel and run the knife along the underside of the top shell, staying as close to the shell as possible. This will release the top shell, which can now be discarded. Hold the oyster in your left hand with the hinge end facing you. Taking care not to destroy the oyster flesh, run the knife along the right side of the shell in order to release it completely. Line a large plate or tray with celery leaves (if using) and sprinkle with crushed ice. Place each oyster on the bed of leaves. Sprinkle each oyster with a pinch of celery brunoise. Serve immediately alongside the Caesar mignonette and halved lemons.